Eating Disorders Awareness Week Begins on February 25th. But what are the Eating Disorders that we need to be Aware of? Anorexia, Bulimia, Binge Eating and EDNOS. Anorexia Nervosa is characterised by weight loss to the point of starvation, sufferers believe that they can never be thin enough seeing themselves as fat even though they are dangerously underweight. Bulimia Nervosa is characterised by bouts of overeating or binge eating which is followed by purging etc to counter the effects of overeating, loss of control and compensating by overeating. Binge eating is extreme overeating and feelings of loss of control. Ednos, is a combination of characteristics of Anorexia, Bulimia and Binge Eating whilst not fully fitting into the category of either. EDAW says, on average, 149 weeks pass before those experiencing eating disorder symptoms seek help. That’s almost three years, 37 months or 1,043 days. On top of this, in a YouGov survey conducted for EDAW, more than one in three adults (34%) in the UK, who gave an answer, could not name any signs or symptoms of eating disorders. It is vitally important to raise awareness amongst people because the sooner sufferers are treated the more likely they are to make a complete recovery. Eating Disorder Awareness Week organisers in addition to working to improve the services that are presently available recognise that they must raise awareness of the signs and symptoms of an eating disorder and encourage and empower people to take action now – no matter how long their symptoms have been present and to raise awareness of the signs amongst carers and parents and everyone who may be suffering or knows someone who is in need of help. 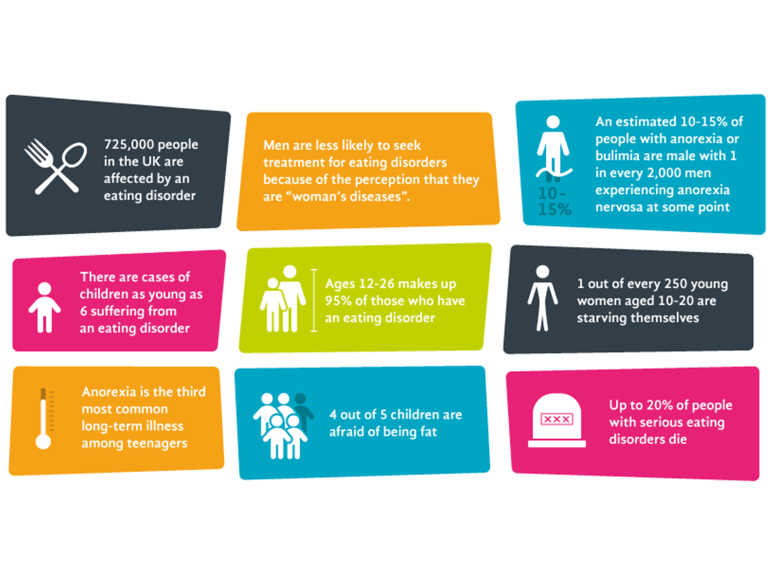 Eating Disorder Awareness Week 2019 runs from 25th February to 3rd March and we encourage everyone to learn more about this health issue that causes so much damage and distress to the victims and their loved ones.